What’s the solution when you’ve got a baby in the buggy and a toddler who demands to walk and then at some unspecified time later just cannot walk one step further and digs her heels in to the pavement refusing to move an inch? A buggy board! 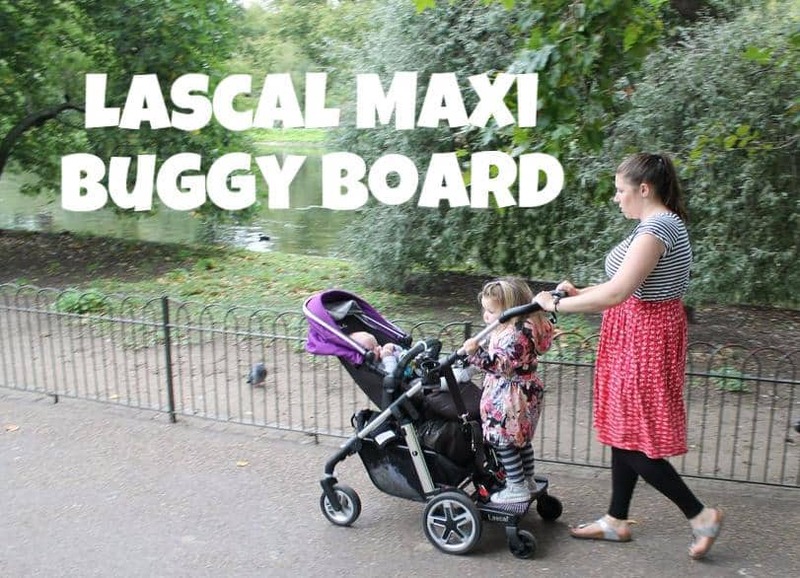 Fitting the Lascal Maxi Buggy Board is fairly easy and took under 10 minutes. There are detailed instructions for all buggy makes/models available too so you can ensure the safest fit for your buggy. First you attach the two connectors using the friction tape to make sure the fit is secure and then the arms and then the board itself. If you wanted to use the same board on more than one buggy then you can buy extra connectors and just leave them attached to the buggy and swap the board around as and when you need to! A non slip platform means it’s safe to stand on even when it’s wet, and you can even buy a seat attachment if there you’re doing longer journeys and little-legs might need a rest! 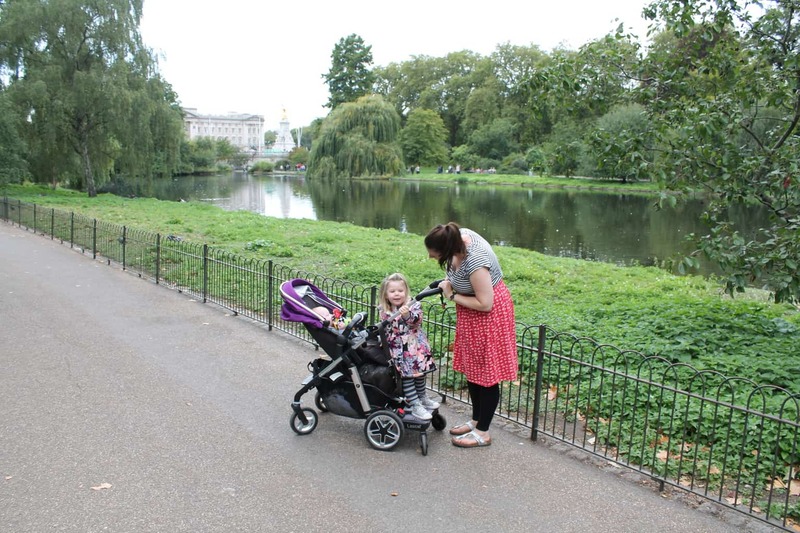 I was a bit sceptical about pushing the buggy with the board on and hitting it with my feet (and I like in flip flops until at least November!) and hurting them but as the board is quite high from the ground there is actually plenty of room for your feet as you walk and you don’t have to hunch over and keep your feet away from the board as there is plenty of clearance beneath it, even for my giant of a husband! When not in use you can pull the board up and keep it in place with the strap that you attach to your handlebar. Alternatively if you’re going out without the toddler you can just flick up a catch on either side and remove the board but keep the fixings in place to attach it again next time you need it. We held off using it until Arlo had outgrown the carry cot part of the buggy as with it attached Athena would have had to lean back and hold onto the buggy frame, which wouldn’t have been too comfy for her! Saying that she does like to ride backwards and have a chat with me as we walk sometimes, she was on the look out for Squirrels outside Buckingham Palace in the photo below! Obviously the added weight of a toddler and the board means you’ll have to get used to pushing with a little more oomph, but actually with my buggy (a Silver Cross Pioneer) it actually helps get over higher kerbs as the weight gives it more momentum, which is something I used to struggle with pre-board (you can read my review of the Silver Cross Pioneer here) but it is worth noting that with this buggy you can’t access the foot brake very easily, so Sam attached the board slightly to one side to make it easier for me! 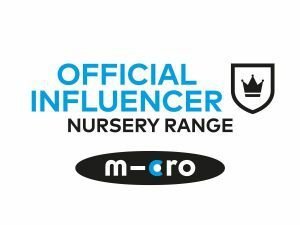 Definitely a great addition for people with toddlers or even pre schoolers who walk lots on longer journeys, and perfect anyone who has had to coax a toddler along on a walk when they’ve decided their legs can’t take it anymore! 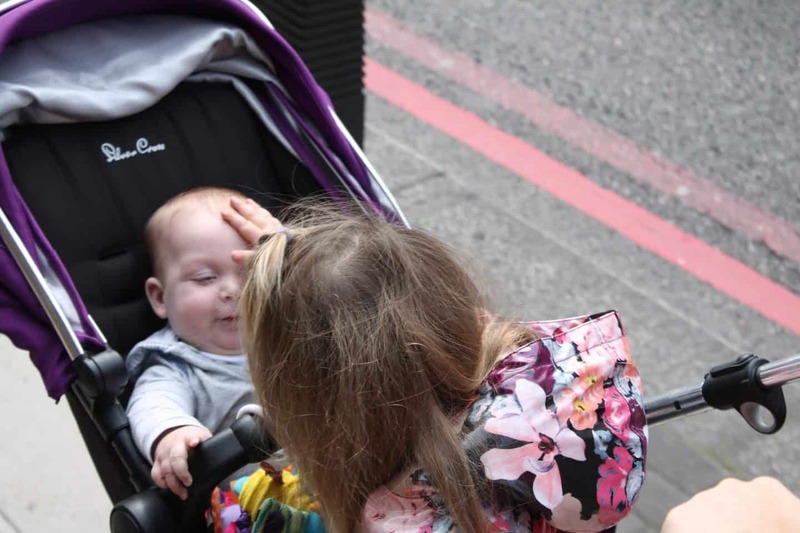 We were sent our Buggy Board to put through its paces by Cheeky Rascals for the purpose of this review, but all words and opinions are my own. 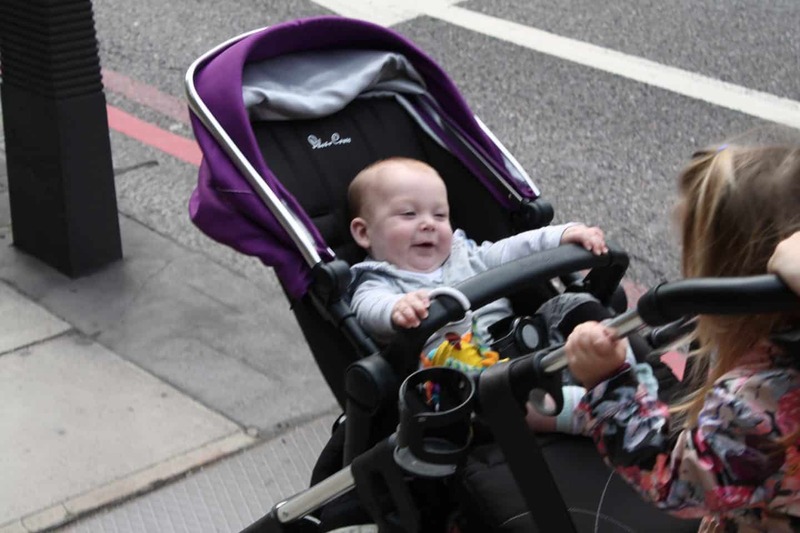 Great review, we had the same buggy board 3 years ago when Leah was born and Lewis was thrilled with his mode of transport. Buggy boards are such lifesavers! I’m expecting baby number two in January, when Little F will be 2.5, so I am on the look out for a good buggy board. Thanks for posting this full review! I think this is going to be something we’ll be needing soon, Toby’s quite happy in the buggy for now but I bet it won’t be long before he wants to walk most of the time. It’s good to here they don’t get under your feet because that was something I was really worries about, especially with my tall husband too. Definitely sounds like a good investment anyway. What an absolute lifesaver! I’ve often wished I had a buggy board but it wasn’t something that would have fitted my old pram so I just coped! Hi, thanks for the review. The Lascal website says you can’t fold the buggy board away with a Pioneer because the basket is in the way. This has put me off purchasing. Did you have any trouble with this? Hi Katie, no it was fine! It didn’t stay vertical when folded but wasn’t in the way of the basket or your feet when walking! Hi Katie – no I had no problems, clipped it to the handlebar and it stayed upright. It wasn’t vertical but it didn’t get in the way while walking and I could still put things in the basket easily enough!